detail of Angela Kallus painting (courtesy Lux Art Institute). North East - a group exhibition of Las Vegas-based artists Fawn Douglas, Justin Favela, Anthony Johnson, Ashanti McGee, Jerry Misko, Krystal Ramirez, Checko Salgao, Lance Smith, David Veliz, and Mikayla Whitmore at the Left of Center Gallery through July 2. 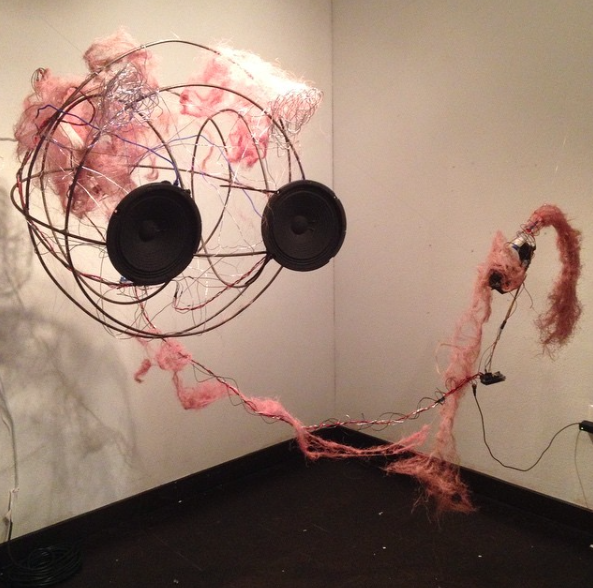 Mikayla Whitmore at Left of Center Gallery (Image courtesy the artist). Intersections: Art, Design, and the Neon Museum, a group exhibit at the Nevada Humanities Program Gallery, June 2 - July 28. S + N artists D.K. Sole, Justin Favela,Maureen Halligan, Mikayla Whitmore and Brent Holmes participated in the performing and visual arts festival Small Space Fest, which opened at Emergency Arts on June 20. Read about the June 20th interactive performances and and installations in Kristen Peterson's Las Vegas Weekly article here. Visual art will be on display through July 21. 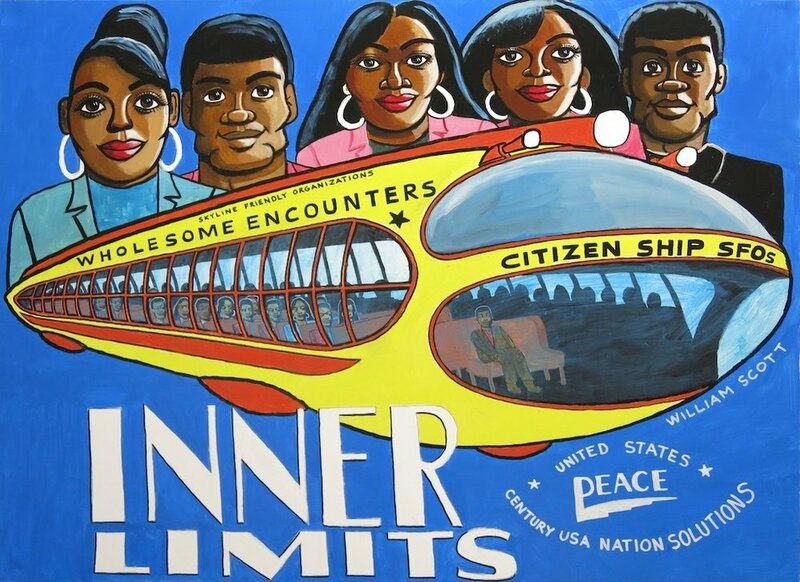 Disconnected: the Creation of an American Phenomenon, at the Donna Beam Fine Art Gallery, June 24 - August 8. Opening June 24, 6-9PM. Lee Cannarozzo curates an exhibition of temporary installations based around artifacts from the Neon Museum. Myranda Bair, High Noon at the Clark County Government Center Rotunda Gallery, through July 8. Las Vegas Weekly article here. Art + Science, curated by Linda Alterwitz at the Contemporary Arts CenterJuly 8-29. Opening reception July 8, 6PM. Jim White at Satellite Contemporary (in Emergency Arts) through July 7. Stick + Move, a three-person exhibition featuring Denver-based artists Kayla Haubenschild, Victoriana Rivera, and Scotty Zaletel, July -9-August 11. Opening reception July 9 6-9 PM. Daniel Hernandez, Genesis, at the College of Southern Nevada Fine Arts Gallery, June 10 - July 30. Michael Heizer prints at MCQ Fine Arts, June 2 - August 13. FIVE, Deborah Aschheim, Erin Cosgrove, Lucky DeBellevue, Ash Ferlito, David Gilbert at the Marjorie Barrick Museum, through September 10. See Dawn-Michelle Baude's review in the Las Vegas Weekly and Carol Cling's article in the Review-Journal. FIVE Screenings: Erin Cosgrove's The March of History and In Defense of Ghosts, and Lucky DeBellevue's Sahara/March. Video screenings at 1 and 3 PM every Saturday through September 10 at the Marjorie Barrick Museum. 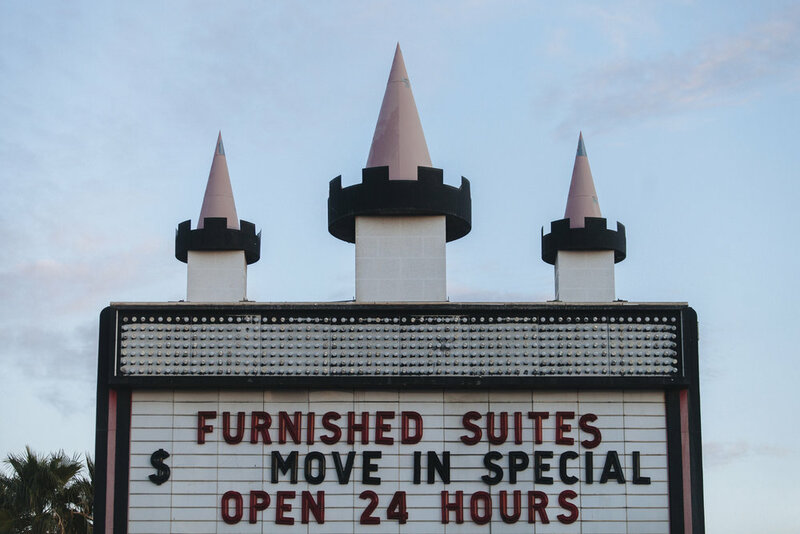 Still from Erin Cosgrove's live action and animated video, In Defense of Ghosts. (Image courtesy the Marjorie Barrick Museum). Aesthetics Primary, a group show at at the Historic Fifth Street School Mayor’s Gallery, through September 29. Featuring Kim Johnson, Susanne Forestieri, Linda Alterwitz, Shelbi Schroeder, Gig Depio, David Ohlerking, Laura McEwan-Dase, James Stanford, Wendy Chambers, Felicia Mora, Nanda Sharifpour, Ali Fathollahi, Kathleen Nathan, Robert Beckmann, Salley Sawyer, Ghiasar Nejad Hanzali, Rossitza Todorova, Dave Rowe, Noelle Garcia, Maureen Halligan, and Yvette LaForce. Open by appointment only. Call 702-229-1012. In Transition: Female Figurines from the Michael C. and Mannetta Braunstein Collection. This exhibition focuses on the female figurine, specifically those forms depicting the transition from maidenhood to motherhood. At the Marjorie Barrick Museum. The College of Southern Nevada, Department of Fine Arts, Art & Art History Program is currently accepting exhibition proposals for its 2017 - 2018 Exhibition Season for the College’s Fine Arts Gallery and Artspace Gallery. Solo and group exhibitions of all media and genre will be considered. The deadline for proposals is September 15. Full prospectus here. "Small Space Fest Delivers Super-Sized Art Experience" by JK Russ, who reports on the Small Space Fest at Emergency Arts for the Huffingtonpost.com. Read it here. "Biblical Tempresses in Neon: San Francisco-based Whitney Lynn Looks at Las Vegas in the Larger Context of Time," Kristen Peterson writes about the current Neon Museum Artist-In-Residence for the Las Vegas Weekly here. Michael Ogilvie's bi-monthly comic Territorial Legends has been picked up by Nevada Magazine. Dawn-Michelle Baude writes about Michael Heizer's prints show at MCQ Fine Arts for the Las Vegas Weekly. Read the review here. Read about the potential collaboration between Robert Ferry and Elizabeth Monacan of Land Art Generator Initiative and Las Vegas via arts advocate Pam Stuckey of Renewable Envoy in Kristen Peterson's "Public Art Generating Power? Maybe in Las Vegas" (Las Vegas Weekly)here. Justin Favela and Emmanuel Ortega launch their new podcast Latinos Who Lunch.The hosts and their guests discuss pop culture, art, identity politics and more.Listen here. founders Andreana Donahue and Tim Ortiz, First Street Gallery Executive Director Rebecca Hamm, and moderated by Paige Wery. The State of Queer Art: Artists Brett Reichman and Daniel Samaniego in Conversation. Read the conversation between San Francisco Art Institute faculty and alumnushere. 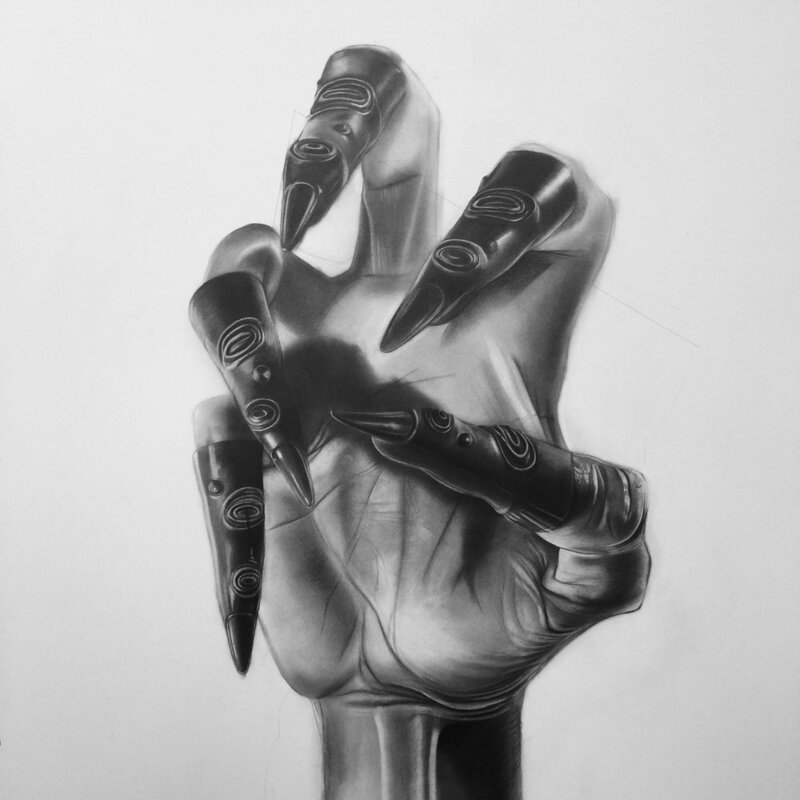 Daniel Samaniego, graphite on paper (Image courtesy the artist). 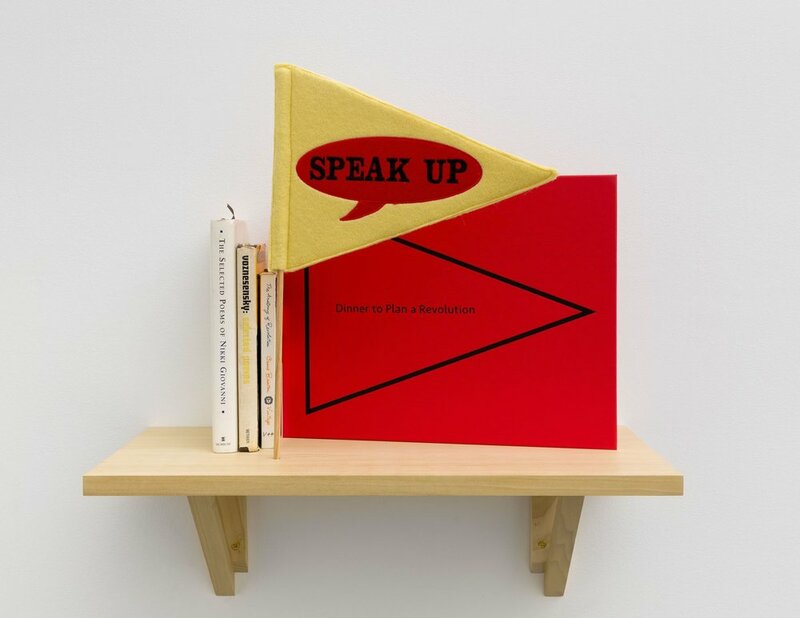 MK Guth: Shout, Recount, Get Drunk at Cristin Tierney gallery in New York, June 21- July 1. Opening reception with the artist, Tuesday, June 21st from 6:00 to 8:00 pm, and performances will run daily from June 22nd through July 1st during regular gallery hours. MK Guth, Dinner to Plan a Revolution, at Cristin Tierney Gallery in New York. Do or DIE-O-RAMA, at Practice in Philadelphia, July 1-29, Opening Reception July 1 from 6-10 PM. Make, Natalie Ball and Noelle Garcia at SOIL Gallery, Seattle. July 7 - August 29, opening reception July 7 from 6-8 PM. Justin Favela is taking part in the group exhibition Con Cariño: Artists Inspired by Lowriders, through October 10, at the New Mexico Museum of Art in Santa Fe, NM. From July 8-10, he will bring his distinctive style to the museum for a three-day residency, working with the local community to create a giant paper lowrider that will be added to the exhibition. Everybody welcome, no experience necessary. Justin Favela in the group exhibition Con Cariño: Artists Inspired by Lowriders, at the New Mexico Museum of Art in Sante Fe (Photo by Mikayla Whitmore). Sharon Butler/Two Coats of Paint recently shared Kirsten Swenson's catalogue essay was originally written for Permanent Maintenance, Peter Soriano's wall drawing project, on view through August 21, 2016, at the Colby College Museum of Art. You can read it here. view of Peter Soriano's Permanent Maintenance, at Colby College Museum of Art. Image courtesy Colby College. Matthew Couper & JK Russ, Salon of Desert Martyrs, at Zoya Tommy, Houston, TX, June 10 - July 9. Read the exhibition review in the Houston Press here. JK Russ, from Salon of Desert Martyrs with Matthew Couper at Zoya Tommy in Houston. (Image courtesy the artist). Emotional Supply Chains, at the Zabludowicz Collection, London, through July 17. The group exhibition of seventeen artists includes David Raymond Conroy's new video commission questioning the ethics of artist as tourist, created following time spent in Las Vegas as part of Zabludowicz Collection's inaugural residency programme in November/December 2015. The exhibition also features the work of Daniel Keller, Eloise Hawser and Korakrit Arunanonchai who participated in the Las Vegas residency last winter. Curator Paul Luckraft, who directs the residency program, wrote about planning and producing Emotional Supply Chains for Elephant magazine, linked here. Daniel Keller, Onanet Spiruline 1, 2015. Installation view, Emotional Supply Chains, Zabludowicz Collection, London. Courtesy the artist and Zabludowicz Collection. Photo: David Bebber. Boston-based artist Thomas Willis shared his recent interview by Ileana Selejan about his ongoing project Retrofit Painting, the nightclub installation he created at Casablanc Boston this past March, and last summer's P3 Studio artist residency he did at the Cosmopolitan of Las Vegas. Read "Dance Like You Mean It: Ileana Selejan in conversation with Thomas Willis"in & BIG RED AND SHINY here. 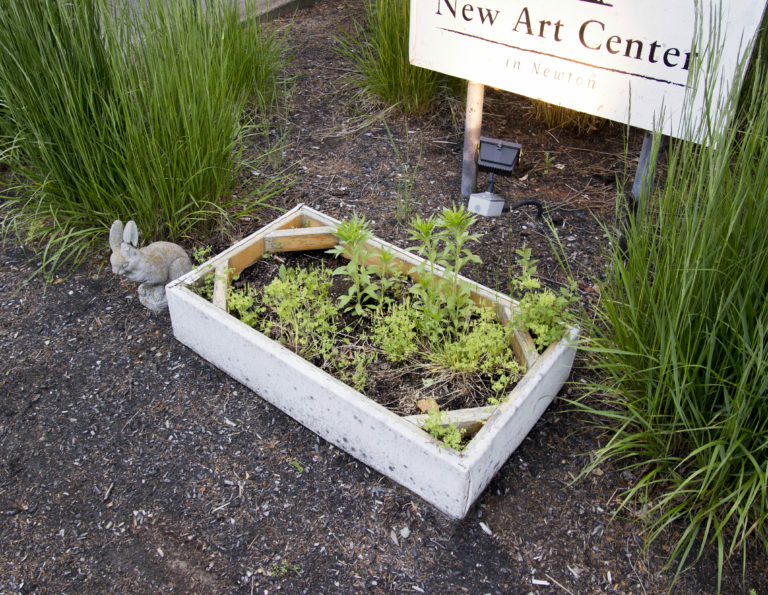 Thomas Willis, Planter, New Art Center, Newton Massachusetts (Image courtesy the artist). 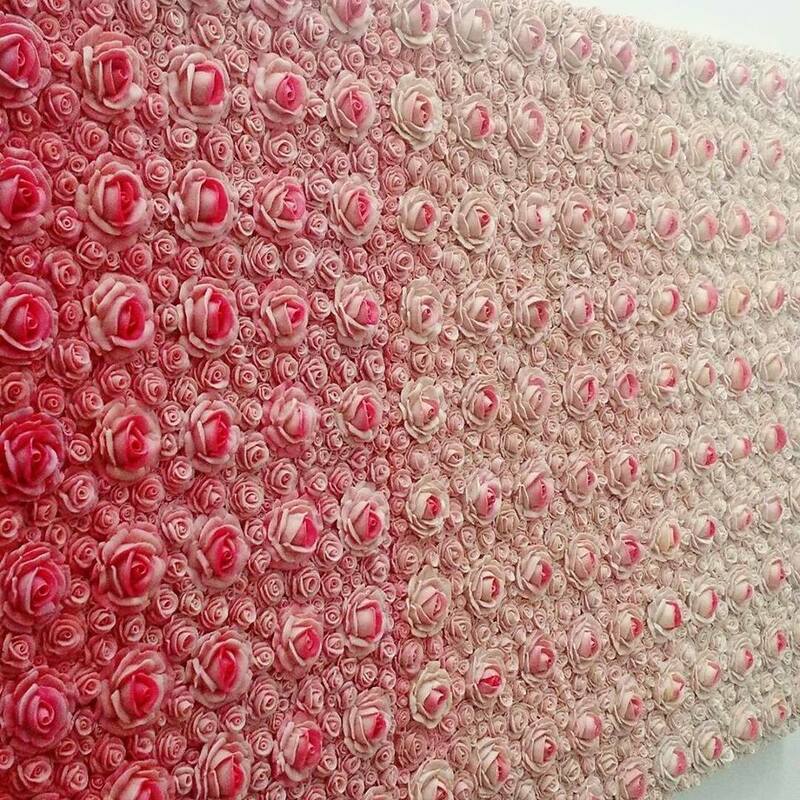 Angela Kallus is Artist-In-Residence at Lux Art Institute in Encinitas, CA through July 9. Her exhibition is on view through July 30. 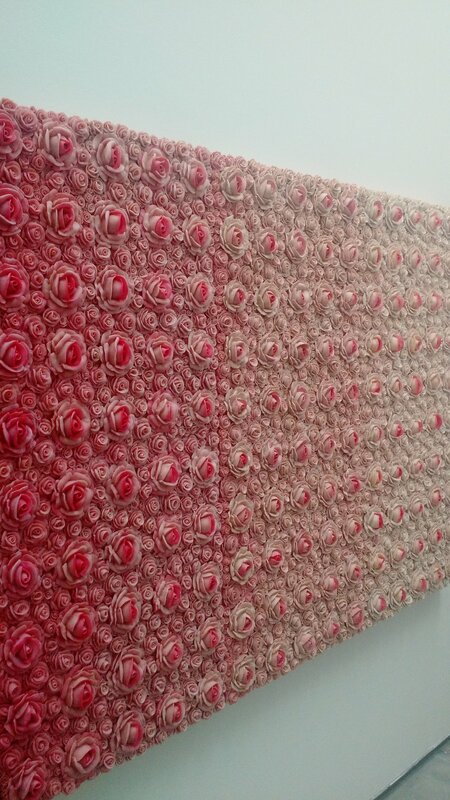 Angela Kallus at Lux Art Institute (Image courtesy the artist). Matthew Cusick is participating in the group project Any Given Book at White Noise Gallery in Rome through July 31. Mary Warner, In The Woods, New Paintings at the Oats Park Art Center in Fallon, Nevada, through August 4. Cindy Rehm, Coming to The Table, an exhibition and programming organized by the Association of Hysteric Curators (AHC) at Angles Gate Cultural Center. Closing reception August 21, 3-5 PM. Cindy Rehm, participating in Coming to the Table, Angles Gate Cultural Center (Image courtesy the artist).